Black Hawk Lock and Key specializes in door hardware replacement and installation. Your home’s security is important which is why we will come to your home and replace or install door knobs/handles, hinges, latch guards, locks, smart locks, peepholes and essentially any other door hardware you can think of. Once you contact us, we will dispatch one of our knowledgeable locksmiths to your location to assess your door hardware needs and proceed with the installation. 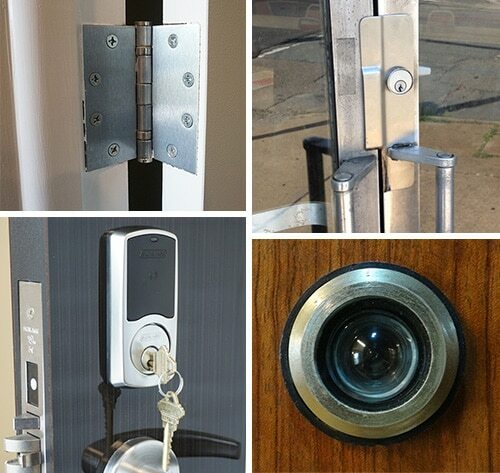 Clockwise from top Left: hinge, latch guard, peephole, and smart lock deadbolt. Just like other door hardware, hinges are available in different sizes and styles. You’ll probably want your door hinges to match your other door hardware. Properly installed hinges are essential in making sure your door works properly. If hinges are ill-fitting, you may notice your door doesn’t close properly. If this happens, you can depend on the door hardware experts at Black Hawk Lock and Key to adjust, repair or replace your door hinges so your door will work properly. Latch guards are an essential part of security that consist of a metal plate attached to the door jamb, with holes drilled in it to fit the door bolt. When the door is shut, the bolt moves through the strike plate’s hole, holding the door shut and protecting the knob from friction. Latch guards help protect door locks from tampering and potential break-ins. Our door hardware experts can efficiently install, repair and maintain all latch guards on the market today. Your safety and security depend on properly working door locks. This is precisely why you need a professional locksmith to install your locks. There are many types of locks and smart locks on the market today and it can be difficult to know which best fits your security needs. One of our experienced locksmiths will help you determine what type of lock or deadbolt you need and will go on to install the lock. Our locksmiths are also available for lock repair and maintenance. An extra added layer of security comes in the form of a peephole. Always know who’s at your door before you answer. Peepholes, also called door viewers, come in different sizes, are customizable and fit all doors on the market today. They are available in many styles and colors and can be high-tech and digital or simple and durable. Our experienced locksmiths will discuss your needs and help you choose the right door viewer that fits your needs and style. When you work with our certified, insured and registered locksmiths, you’ll get honest pricing and guaranteed service. Black Hawk is a local locksmith service that will work hard to gain your trust and leave you satisfied with our work. Not only do we have a local lock shop, but we also offer a mobile locksmith service. If you’re in the Rochester or Pittsford, NY areas, give us a call and see what we can do for you.